The other day I wrote about taking the older boys to meet their grandparents for a week away. Of course, in order to get them there, all six of us piled into the family SUV and went for the drive. Halfway between where my in laws live and we do is about a two and a half hour drive. Making it five full hours in the car. While we were driving I took a couple of pictures of Eli using a cool new product we were given. It is called the No Throw. 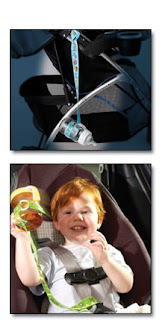 It is a tether that fits around a bottle or sippy cup and can be attached to the car seat, stroller, high chair, etc. We have used it on our jogging stroller for while I walk with my sister. We also really enjoy it in the car. No more rummaging around one handed trying to find the bottle on the floor behind the seat where baby threw it! If he manages to throw it “overboard”, i just grab the strap and pull it up. Super simple, very effective and much easier to please an often fickle little one who one moment thinks they are finished and the next moment thinks they are the thirstiest they have ever been! I love the ease of velcroing the strap right around the bottle. It goes right on with the D ring and adjusts to the size you need. The one drawback we have found is that it does not fit the Avent training cups we have. I wish it was a tad bigger to accommodate that size cup. But all of our other sippy cups seem to fit, even though Eli is refusing to use them and is strictly bottling it right now! The No Throw is a great mom invention, made for moms by moms. The idea came to twin sisters who were traveling with young sons back and forth to see each other from Detroit to Chicago. Their sons would throw their sippy cups around, and they came up with the idea to keep them within arms reach. Definitely a great idea! We received the great blue sports ball patterned No Throw, but there are sixteen different designs. No Throws can be purchased at most Walgreens locations, as well as many other retail stores and online through their website. The No Throw retails for ONLY $5! One lucky Momma D and Da Boyz reader will win their own No Throw in the black and red pattern. To enter the No Throw giveaway, please visit their website. Pick what your favorite pattern is and then come back here and leave a comment telling me what that item is. YOU MUST DO THIS FIRST OR OTHER ENTRIES WILL NOT COUNT. Please be sure that your profile has your email right on it, or be sure to leave your email address in your comment. This giveaway is open to US residents only. 7. Add our Facebook page! You can find a link in the right sidebar. Come back here and comment. The No Throw Giveaway will close at 11:59 pm on July 13th. I love the blue with sports (NT03). Hi…I would Love to follow! I from the MBC 100. I like the orange with butterflies. I like the blue with trucks or dinosaurs. OK…. I have set up my profile… and I am back to comment on the brown with flowers! I wish I had my own kids that would enjoy this, well who am I kidding.. the not having to reach and search for a bottle or cup in the car would have been awesome years ago…. I have friends with kids and cousins with kids, and I love giveaways……..
OK, so I am getting the hang of this blog thing and the give aways…..
and your personal facebook…. I am a MOMMA D FOLLOWER ALL OVER THE PLACE…..